The Napa Valley is renowned throughout the world for its premier wines, and the Santa Barbara wine tasting region was made famous by the movie “Sideways”. Sonoma County is known for its quaint towns, luscious wines, and scenic vineyards. The Lodi and Amador wine regions are well known in Northern California for their robust reds and the Paso Robles wine region now boasts nearly 300 wineries in its appellation. 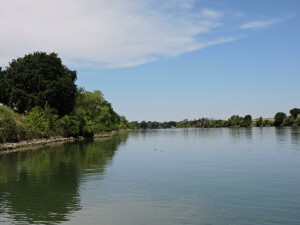 But hidden in the backyard of California’s state capitol, the undiscovered wine tasting region of the Sacramento River Delta beckons to residents as well as visitors looking for a convenient, yet local getaway. Take a leisurely drive along the meandering Sacramento River on a warm summer day and experience unhurried, uncrowded wine tasting at family run, local wineries. Enter the Delta and be instantly transported to a world of pear farms, and grape vines, and small towns full of California history still occupied by real people living a small town life. I just love the Delta. I fell in love with it the very first time I drove down the river road, past Rio Vista, where suddenly, the Sacramento River widens and changes, flowing toward the Antioch Bridge, eventually making its way to the San Francisco Bay. Discovering wine tasting in this region that I love just makes it even better. Enter the region through the tiny town of Freeport, gateway to the Delta. Cross the historic Freeport Bridge, once used to film the movie “The Prize” to the west side of the river. Continue south about 2 miles to the Old Sugar Mill, a repurposed sugar mill that now houses wine tasting rooms for eleven area wineries. It would be easy to spend all day here, but see more of the region and move on to Bogle Winery, just a few miles further south, past Clarksburg on the South River Road. Bogle is the perfect place to enjoy a picnic on the spacious grounds, surrounded by vineyards. 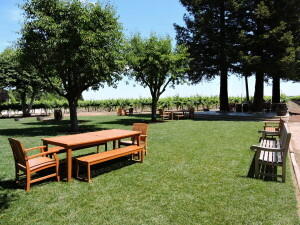 The grassy area is dotted with picnic tables and chairs, or take advantage of the balcony seating upstairs outside of the tasting room, while enjoying a bottle of wine. 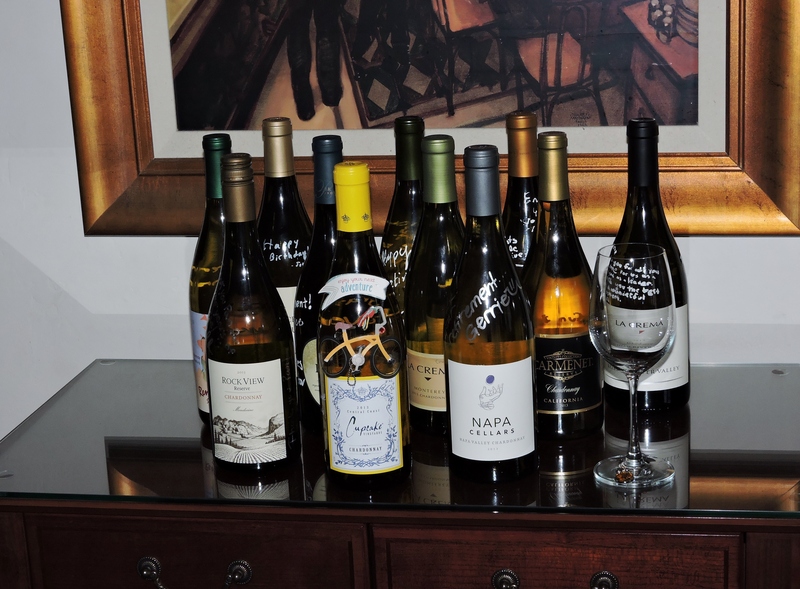 My favorite wines are the Reserve Chardonnay, the Viognier, only produced about every other year, and the Phantom Red, a blend of petite sirah, zinfandel, cabernet sauvignon, and mourve`dre. 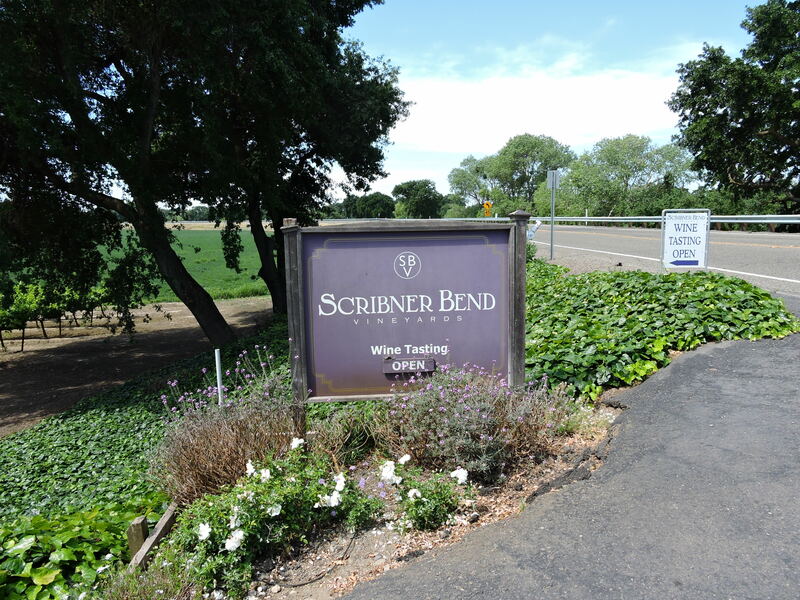 Back on the river road towards Clarksburg, cross over the Freeport Bridge and head south on the River Road (Highway 160) to Scribner Bend Vineyards, owned by Mark and Lorraine Scribner. The winery offers a small, but lovely picnic area surrounded by rose bushes, and a giant outdoor tent used for weddings and winery events. Staff are friendly and knowledgeable and always happy to pour a second taste of something you tried but aren’t quite sure about. 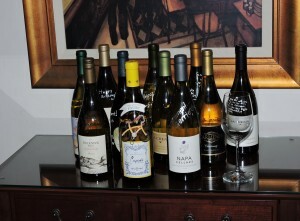 I love the Reserve Chardonnay, one of the newer additions to their wine selection. This wine only comes in a 375 ml bottle and is reminiscent of that old fashioned, oaky, buttery chardonnay. There are now twenty wineries in the Delta wine region. Not all have tasting rooms yet, but look for that to change in this wine growing region as more and more Northern Californians begin to discover what has quickly become my favorite place to wine taste. Looking for a fun place to eat before hitting the wineries, or in-between? Try Husick’s in Clarksburg. This restaurant, opened in October 2014, by Katherine Van Diest, boasts barbeque ribs, tri tip, and other meats. The atmosphere is funky and the restaurant serves 14 different beers on tap plus wine tasting from four local wineries. Alternatively, the Dinky Diner is across the street on the river side and serves what I would describe as an old-fashioned hamburger grilled right there in their old fashioned road side trailer. Sit outside at picnic tables and enjoy the river view while you eat your lunch. Wine tasting tours are available through Delta Heartbeat Tours, Thursday through Sunday at a cost of $60 per person. The company uses comfortable mini-buses to visit some of the Delta’s best wineries and also offers tours to 9 Delta towns as well as custom tours. www.deltaheartbeattours.com or (916) 776-4010. I love the Sacramento River Delta and its wine tasting region so it’s fitting that my first review should be from a winery in Clarksburg. Today, I’m tasting a 2012 chardonnay from Rendez-vouz Winery, one of the many “goodbye wines” from my former co-workers (see the picture and story behind the “goodbye wines”). A good chardonnay can be served un-chilled and this one came straight from my wine cellar. The color is a faint yellow, lighter in color than some chardonnays. 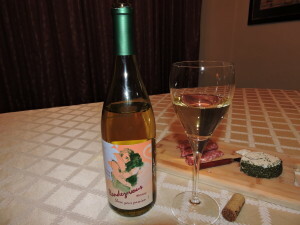 The nose is very clean with vanilla overtones, I taste butterscotch in the mouth, and this wine shows some body with a creamy, lingering finish. The alcohol content is 14.4%. The label on the bottle is perfect. It reads “Share your passion”. I’m passionate about chardonnay and I give this particular wine two thumbs up. Rendez-vous chardonnay can be purchased directly from the winery, either online or in their tasting room, located in the Old Sugar Mill. 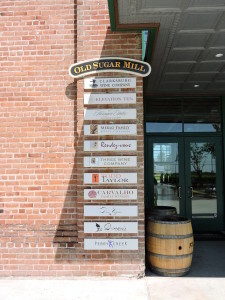 The Old Sugar Mill is a collection of wineries at 35265 Willow Avenue, just down the road from Clarksburg, California, in the Sacramento River Delta (read more about this wine tasting region here). The wine retails for $24.00 a bottle, but wine club members save an additional 20%. To learn more about Rendez-vous Winery, visit their website. I’m a lucky girl. For many years, I worked in a fun and fulfilling job, made a good living, and still had the chance to travel pretty extensively. A few months ago, I finally left the old 9 to 5 gig to see more of the world and write travel articles full time with my favorite travel partner, Gary. But, somewhere in the back of my brain, ever since I earned the nickname “Chardy Girl” in Australia, I’ve also had this dream of blogging about chardonnay. It seems my co-workers knew me better than I realized, because their sendoff gift was comprised of eleven bottles of chardonnay signed by everyone. I took that as a sign that it was time to get my act in gear and get this blog off the ground. I’ll be reviewing each of these bottles of wine over time. Some are already old favorites. But, I’m told there are a few pretty special, hand-picked bottles of chardonnay in the bunch. Won’t this be fun to discover which ones? What? No Chardonnay on the menu??? So, I’m sitting in a bar in San Francisco, hoping to order a glass of wine before the Chris Botti concert and I can’t find a single Chardonnay on the menu. We’re in San Francisco, for goodness sake. Sonoma and Napa are in our backyard! “Seriously, Mr. Bartender, the only white wines you have on the menu are an albillo, an albarino and some kind of chenin blanc/reisling blend? I’m sorry, but your blend does not compare to a chardonnay. It doesn’t even come close”, I protested. I’m rebelling! I’m standing up for chardonnay and I don’t care if you are a sauvignon blanc lover or eschew white wines altogether because you only drink red wine. You won’t read this blog any further anyway.